Disney California Adventure is the second park at Disneyland Resort in Anaheim, California, and the newest of the American Disney parks. Even though Disneyland has the name recognition, Disney California Adventure has some of the best Disney rides in the world. In this post, we provide a complete guide to all the rides (plus some other attractions) at Disney California Adventure. If you’re looking for information on the rides at Disneyland park, we have a guide to those as well. We also have a plan for how to visit these rides in a single day in our one-day Disney California Adventure Itinerary. We cover all of these rides in detail below, so if you want to read more about them just keep reading (or CTRL+F straight to them). We will say—we actually personally prefer Guardians of the Galaxy — Mission: BREAKOUT! to Radiator Springs Racers, but we also think Radiator Springs Racers is probably the superior ride in general. Anyways, onto the guide! For each attraction, we give a “Riding it” style tip. For the most part, this will just tell you whether to (1) visit at rope drop (read more about rope drop at Disney California Adventure), (2) get a FASTPASS, (3) expect a short wait, or (4) visit midday while waits across the park are long, the heat is high, and you’re waiting on your next FASTPASS. We also indicate, next to the ride names, whether these rides offer FASTPASS or a single rider line. If you don’t know about FASTPASS and MaxPass at Disneyland and Disney California Adventure, we recommend adding our guide to your reading list. If you’re a Disney hotel guest, you’ll want to separately read our guide to Extra Magic Hour at Disney California Adventure. Grizzly Peak is one of the two major lands near the front of the park. From the main entrance, you’ll head down Buena Vista Street and make a right at the fountain to enter Grizzly Peak. Passing through the land, you’ll exit in Paradise Gardens Park by The Little Mermaid. Guests who enter the park from Disney’s Grand Californian Hotel & Spa will enter directly into Grizzly Peak. While not without its flaws, Soarin’ is a beautiful, thrilling experience. The ride takes you on a simulated hang gliding adventure featuring real scenes from around the world. Riding it, we consistently hear other guests marveling at the beauty of the ride. Riding It: It’s usually best to grab a FASTPASS for this one midday. We avoid it at rope drop because of its long load times, but on a slow day you’ll catch it at under 30 minutes a few hours into the day. Midday, be prepared for the entire experience to take 30+ minutes even with a FASTPASS. Grizzly River Run is a rapids raft ride most similar to Kali River Rapids at Walt Disney World. You will get wet as your raft twists and turns down the Grizzly River. Riding It: Waits and FASTPASS availability for Grizzly River Run are highly weather-dependent, with it getting the most attention on warm days or during warm hours. Typically you’ll want to try and grab a FASTPASS for this midday when the heat is highest, but this can require precise timing, and it will be the busiest time of day. If you don’t want to risk missing it, visit it after Cars Land and Pixar Pier at rope drop. Waits are usually still short unless it’s already a hot day. The Redwood Creek Challenge Trail is an explorable area that is essentially a ropes course for kids. Some activities are restricted to kids, but adults can definitely find some fun exploring the area. Visiting It: Although it’s outdoors, this is a good midday activity, especially if you’re waiting on your FASTPASS return time for Soarin’ or Grizzly River Run. It usually has limited hours, so don’t count on visiting too early or too late. If you turn left at the fountain, you’ll head into Hollywood Land. Once the new Marvel-themed area is completed, this land will connect to it. Through 2019, though, the land dead-ends at Guardians of the Galaxy — Mission: BREAKOUT. Guardians of the Galaxy — Mission: BREAKOUT! is a high-thrill elevator drop ride. The ride was formerly the Tower of Terror before being reimagineered into its current story. While we have a deep appreciation for the eerie suspense of Hollywood Studios’s Tower of Terror attraction, Mission: BREAKOUT! is an undoubtedly exciting, fun, fresh take on the ride. While we think Radiator Springs Racers is probably the better ride, Mission: BREAKOUT! is our personal favorite. Riding It: We usually make Mission: BREAKOUT! our second FASTPASS reservation of the day (after either Radiator Springs Racers or Toy Story Midway Mania!). There’s no real problem heading there at rope drop (assuming you have a Radiator Springs Racers FASTPASS), either, but ongoing construction (through 2019) makes its location a bit of a pain. This is a dark ride through the story of Monsters, Inc. It has one or two notable effects, but you’re mostly here because (1) you love dark rides, (2) you love Monsters, Inc., or (3) you’re out of other rides at Disney California Adventure. Riding It: There are three circumstances in which we ride this. First, if we’re getting off Guardians of the Galaxy and the wait is 5 minutes, we’ll get it out of the way. Second, if we can catch it with a wait under 30 minutes after we’ve finished all the major rides, we’ll consider riding it. The limited ride selection at Disney California Adventure can mean this one gets way outsized waits. However, there is a third option—Buddy Pass. While Disney is pretty silent about this system, Buddy Pass is a separate line for riders who can fit in one row of the vehicle—that is, groups up to two adults and a lap child. Ask the Cast Member for a Buddy Pass to be directed down the exit. The ride is often—if not usually—a walk-on using the Buddy Pass. Two of the three Red Car Trolley stops are actually on Buena Vista Street, but the third is in Hollywood Land and that’s where we’re placing it for this post. This is a trolley ride through these two areas of the park—basically this park’s version of Main Street Vehicles. Riding It: The Trolley has an annoyingly erratic schedule. Unlike Main Street Vehicles, it is typically scheduled to run all day, but it just disappears at seemingly random times (it is used for shows like the Red Car Trolley News Boys, so the times aren’t wholly random). I wouldn’t plan to ride it unless I could see it heading to a stop. The next three attractions are all indoors and located in a single building—the Sunset Showcase Theatre. The Animation Academy is one of the attractions inside the Sunset Showcase Theatre. Every 30 minutes, a class assembles for a 15 to 20-minute course on drawing a character. The schedule of characters is posted outside the classroom. Visiting It: You can swing by most anytime during operational hours and expect no wait. Classes are at the top and bottom of the hour. For more popular characters (e.g. Mickey), you may want to arrive about 15 minutes early to be safe. The Sorcerer’s Workshop is one of the attractions inside the Sunset Showcase Theatre. The interactive space has a few activities, but the highlight for us is drawing our own zoetrope—we try and make one every time we visit. Visiting It: Walk through it when you want to get out of the sun or before or after another Theatre attraction. If it isn’t for you, you can quickly leave. Turtle Talk With Crush is a really fun show for kids. The physical setup is simple: a screen featuring Crush (from Finding Nemo) and seating for an audience. But the actual show is interactive, allowing members of the audience (mostly kids) to have improvised dialogues with Crush. While not thrilling, it is cool technology featuring a character most of us love. Visiting It: Shows are held every half hour. 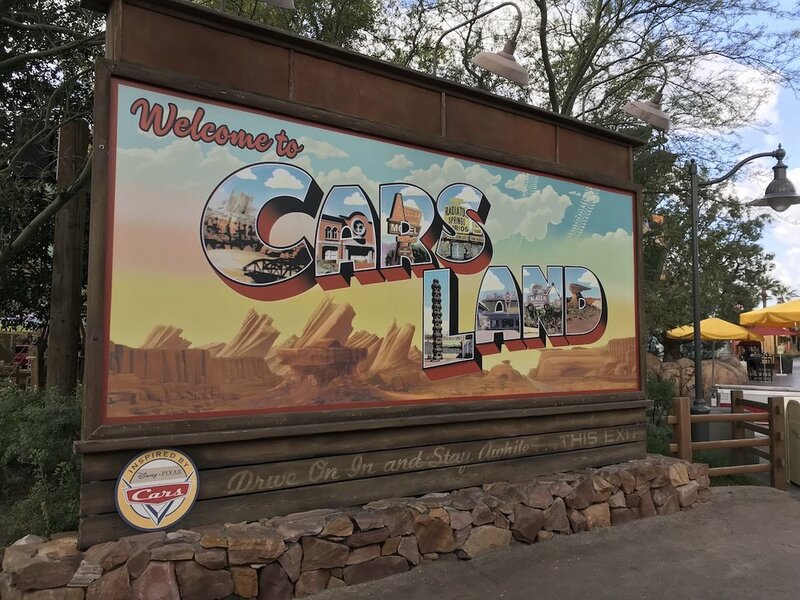 Cars Land is one of Disney’s newest lands and one of its most beautiful. The scenery alone make Cars Land worth a visit, but it’s also home to the best rides in the park—Radiator Springs Racers. Radiator Springs Racers is arguably the best ride at all of Disneyland Resort. It’s is altogether a scenic outdoor ride, a fun and surprising dark ride, and a fantastic thrill ride. With Mission: BREAKOUT!, it’s one of two must-ride attractions at Disney California Adventure. Riding It: You either rope drop Radiator Springs Racers, or you get a FASTPASS for it. It regularly has the longest waits at Disneyland Resort, and FASTPASS distribution regularly ends before noon. While I’ll say that I’ve seen kids who love this ride, I don’t get it at all. This is a trackless “dancing car” ride. Basically two people sit in a car that “dances” with other cars on a platform, sort of in the same way as Mad Tea Party or Mater’s Junkyard Jamboree, but with less spinning (still some spinning). Riding It: The location in Cars Land and popularity with small children gives this one long wait times. Typically we try and ride it early in the morning (the first two hours of the park being open). Right after Radiator Springs Racers (or before it if you’re using a FASTPASS for Radiator Springs Racers) is a good time. This is like a Mad Tea Party-lite ride. The vehicles swerve around the platform and have an extra element of swing to them, but you usually won’t leave completely discombobulated. This is the same ride system as Alien Swirling Saucers at Walt Disney World’s Hollywood Studios. Riding It: Though it isn’t as popular as Luigi’s Rollickin’ Roadsters, waits can get high midday. Typically we try and ride it in tandem with the other two Cars Land rides in the morning. Pacific Wharf is a centralized land in Disney California Adventure that is mostly just for dining. It has no rides and only one attraction. The Bakery Tour is a walkthrough tour (with a film and display signs) of the park’s sourdough bread bakery. Visiting It: You can pass through anytime during operational hours. It will probably require ten minutes, maybe less, to read all the displays. Paradise Gardens Park is one of two lands in the far back of the park—the other being Pixar Pier (these two lands used to be just Paradise Pier). The rides at Paradise Gardens Park among the least popular in the park, but they all have enjoyable elements. This is a dark ride through the story of the Little Mermaid. Best we can tell, it is identical to the Magic Kingdom ride Under the Sea ~ Journey of the Little Mermaid except for some minor narration changes. Visiting It: If you can walk on it later in the morning, go ahead. We usually save it for the evening and ride it while waiting for World of Color. Only Little Mermaid zealots should consider waiting more than 20 minutes for it. The best way to describe Golden Zephyr is just to show you the below picture. As you can see, it’s a swing ride with 12-person vehicles. It’s a fun little ride, but unfortunately it can’t operate in even the mildest windy conditions, which can cause skewed wait times as it opens and closes throughout the day. Riding It: This is among the lowest priorities, with waits rarely exceeding 20 minutes. On slow days, walk on it in the morning with no wait. On busier days, you’ll probably wind up pushing it into the afternoon for a 15-minute wait. Goofy’s Sky School is a kiddie coaster that is sort of like Primeval Whirl (at Disney’s Animal Kingdom) without all the awful aspects. Okay, there’s still some jerkiness, but it’s not completely terrible. Riding It: As the least popular FASTPASS ride, you’re usually best grabbing a midday to late FASTPASS for this one rather than wasting any time on it earlier in the day. That said, it is often a walk-on for the first 30 to 60 minutes of the day, and you might hop on while in the area anyways. Jumpin’ Jellyfish is a small, outdoor drop ride. You sit in a small carriage under a jellyfish, are raised a small height, and then dropped (pretty slowly) a few times. The best part is if you grab one with a view facing the rest of the park. Riding It: Same as Golden Zephyr—this is among the lowest priorities, with waits rarely exceeding 20 minutes. On slow days, walk on it in the morning with no wait. On busier days, you’ll probably wind up pushing it into the afternoon for a 15-minute wait. Silly Symphony Swings is a classic waterfront swing ride. It’s definitely worth a ride for the views and the overall pleasant experience. Riding It: Again, this is another low-priority ride. We’ll often stack these in the morning if we can get right through them, but you may need to push it into the afternoon on busier days. Pixar Pier is the newest land in Disney California Adventure…sort of. The land is a reimaingeered piece of the former Paradise Pier. As of March 2019, it has three rides, but two more are coming in 2019. Incredicoaster is a reimagineering of the “California Screamin’” coaster. As a roller coaster, it’s fine. It features a few cool turns and one loop. As an Incredibles ride, it’s fine, with pretty negligible appearances by most of the characters. Its popularity has faded since its debut. Riding It: Incredicoaster is a low priority FASTPASS. We’ll walk on it if we pass it in the morning, but we’ll never wait as it’s typically one of the last FASTPASS rides to run out of times. There’s also a single rider line if you have to ride it in the middle of the day without a FASTPASS. Toy Story Midway Mania! is a fun-for-all-ages carnival 3D carnival-style game attraction. You and a partner (along with the two people on the other side of your vehicle) ride through five carnival games, using your cannon to throw/shoot/toss virtual objects at targets to score points. Riding It: As the best family ride at Disney California Adventure, Toy Story Midway Mania! always commands a long wait and tough FASTPASS availability. We typically try to visit it as part of our rope drop strategy, either heading there first (if we have a Radiator Springs Racers FASTPASS) or grabbing it as our first FASTPASS. While others may point to the awesomeness of Guardians of the Galaxy—Mission: BREAKOUT! as a reason to prioritize that ride early on, Toy Story Midway Mania! usually has worse FASTPASS availability and is surrounded by rides that won’t have waits early in the morning. 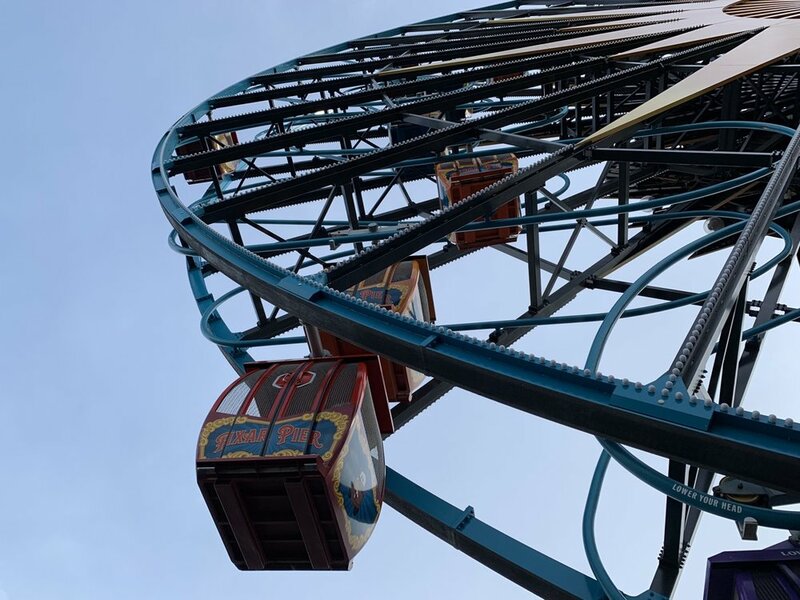 “Pixar Pal-A-Round” is just a new name given to Mickey’s Fun Wheel, the large Ferris wheel. There are two versions of the ride. The non-swinging cars are standard Ferris wheel cabins. They swing a little bit, but nothing more than an ordinary Ferris wheel. The swinging cars are a much more exciting experience. These roll along rails that take them toward the center of the wheel and back out again as it rotates (the pic below better shows this). Motion sickness bags are provided. Riding It: Pixar Pal-A-Round is a tough one. It will take ten to fifteen minutes to ride, depending on how loading and unloading goes. It also doesn’t have FASTPASS. Basically, if you don’t mind walking back and forth from it, push it later into your morning, say 90 minutes to 2 hours into the park’s day. But if you’re thinking you’d rather not be running back and forth, just hop on it when you’re by Incredicoaster and Toy Story Midway Mania!, it won’t ruin your morning. Opening in April 2019, Jessie’s Critter Carousel is a reimagineering of King Triton’s Carousel of the Sea. It is expected to be a standard carousel. Riding It: Waits may be a little inflated when it is brand new, but carousels tend to be the shortest waits throughout the entire day. Ride it whenever you can make time for it, but we would probably push it late in the day even if it was empty in the morning. Opening in 2019, Inside Out Emotional Whirlwind is a reimagineering of Flik’s Flyers. It will presumably be the same style hybrid aerial carousel / swings where you can sit backwards if you want. Riding It: Waits may be a little inflated when it is brand new, but we expect this one to behave roughly in line with Flik’s Flyers in the past and the Paradise Gardens Park rides, with waits maxing at 20 to 30 minutes on busy days.